I have many enjoyable moments as a home inspiration blogger and one is receiving the latest designs from some of the brands I adore. This week I received the latest release for Designers Guild's 2013 Autumn range. Often we think of autumn and associate it with earthy colours, Designers Guild look at autumn from a completely different aspect and I am swooning at their jewel toned colours and beautiful patterns. The new range is stunning to say the least, colours such as amethyst, slate and magenta and emerald, jade and cobalt feature in their range, which more than lives up to my expectations from this world wide brand. Over dyed and dip dye are still making a statement as seen in the rugs above. If you wish to see more of Designers Guild's new range, you can visit their on-line showroom. If you live in Auckland and looking for a stockist, you can find Designers Guild wallpapers and fabrics at Allium, 11 Teed Street, Newmarket. 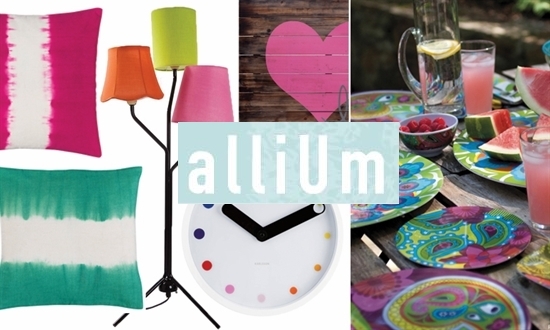 Allium are one of Auckland's top interior design stores and carry a range of colourful homeware and beautiful furnishing that compliment the Designers Guild range perfectly. I am digging overdyed Turkish rugs at the moment.. I wonder if that is something one could DIY?? .. Hmm!